A few weeks ago I discovered a new resale shop. I'm embarrassed to say that it's walking distance from my house AND has been there for a few years now, but I only just found out about it. So it's only "new" to me. I now have one more reason to be grateful for our Berwyn Facebook page since that's how I discovered this wonderful shop. Each piece is 3-4 yards long and 36" wide. The fabric is a lovely apparel cotton - soft with nice weight and some drape. I paid $15 for all three. I particularly love the colors in the last one, and I think it might work with the pencil skirt I finished this past weekend (no pictures yet - I want to wait until I finish the top that goes with it). I guess the sleeves aren't that bad, but they are all wrong for my body. I'd look like a linebacker if I wore something that emphasized my shoulders in that way! And there's something about the drawings that just looks so harsh. I keep thinking that if the blonde turns her head, she'll chill me with a look of icy disdain ("So you think my sleeves are horrendous? It's your shoulders that are the problem, missy"). I'll just have to turn the pattern envelope over when I'm working on the blouse. I also found drawer after drawer of buttons in the shop. How I love unearthing buttons! I'll have more treasure to show next week because I'm planning a trip to my favorite thrift store (The Economy Shop in Oak Park) on Thursday. They only open for sales 3-4 times a month and I haven't been since June. I've found all sorts of beautiful things there in the past, from fabric to buttons to fur collars and even a chair cover that I made into a wallet. In other news, I finished two skirts for clients and my class at The Little Bits Workshop is now underway. 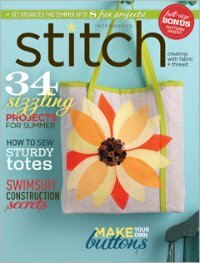 And I just found out that one of my handbag designs is going to be published in Stitch magazine, so I'm having one of those weeks where I actually feel like I know what I'm doing! I've got a sewing project on the table this week that is likely to knock that straight out of me. I hope to give you an update on that one a little later this week. Keep some fingers crossed for me! 2 comments on "Found Treasure - The Exquisite Revisit Resale Shop"
Looks like you made quite a score on the vintage fabrics and buttons....and I love the peplum on the Vogue pattern. Sometimes the facial expressions on the drawn models are hilarious! Good luck with your classes, and congrats on your magazine submission.... ;-)!